"the ocean lies deep within my heart"
Thanks for the transcription Isildilmë. Above is a another transcription of "keep the faith" I found on an online image search which differs slightly to yours (the second symbol in "faith" is completely different and the third symbol has a dot above it). Please could you explain why there is this difference and which transcription is more appropriate as I want to be certain before getting it tattooed? This one was transcribe letter by letter treating only the "th" as a combination : F A I TH (in this case the "i" as to be written over the "th", so I can read "faith" there. Which one is more appropriate ? Maybe the two, maybe none, maybe hers, maybe mine. 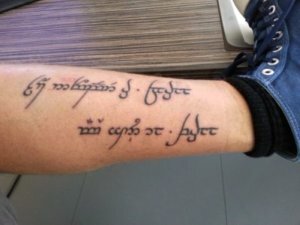 Did you read the first post of this thread, where I explain that many people use Tengwar in many ways, that Tolkien himself used variations and that we try to use what we found of him and to complete with our own perception and best attempt ? Well, that's it. There is no warranty either of these would be 100% Tolkien approoved. You have to live with that, or to forget about your project ! I was wondering if you could the following for me laid out like this in the fonts Tengwar Annatar (Italic) and Tengwar Formal (Italic). I am looking to get this tattooed. shamrock387 wrote: I was wondering if you could the following for me laid out like this in the fonts Tengwar Annatar (Italic) and Tengwar Formal (Italic). I am looking to get this tattooed. these words have been done already, but as you also ask for Tengwar Formal italic, I think I'll do them again, they have probably not been done in that one. I'll add your request on my list. okay got it, cheers for the taking the time to explain it to me. I feel bad asking, but please could you transcribe "keep the faith" again in tengwar annatar (regular) but using faith as shown in the link below. I think I am going to use that interpretation. mmm, I don't know how to say that without looking rude or something... but I will say no. I actually do the transcriptions using a mode I judge as good as possible. Everybody is free to follow me or not, and to choose what he/she wants to take from me. But I won't change my transcription mode to adopt one that is to my taste not as good as what I use normally. I won't post a pic with a transcription that I know I would not suggest. Other people could use it and think I agree with it, and anyway it's again my vision to do so. You are free to use the image I posted and to do a "collage" changing my "faith" for the other one and saving the new image in your computer, or to just copy the whole thing in an automatic transcriber that will probably give you this transcription as a result because automatic transcribers don't "think" and seem not able to analyse diphtongues like "ai". But I won't do it myself. I hope you understand this and that you are not offended. Hey everybody ! I just realised that today is my 3rd TORc birthday ! If you can't resist to send me a gift, email me. This is a day of note for both of us! Congrats on your third anniversary!! Isildilmë wrote: Hey everybody ! I just realised that today is my 3rd TORc birthday ! Congratulations! You've been such an important presence on the forums all that time. Hi, can you transcribe the word Guardian please? Last edited by Glenn031 on Wed Nov 28, 2012 9:49 am, edited 1 time in total. Glenn031, you do mean transcribe, don't you? Almatolmen wrote: Glenn031, you do mean transcribe, don't you? Could you transcribe this for me please? 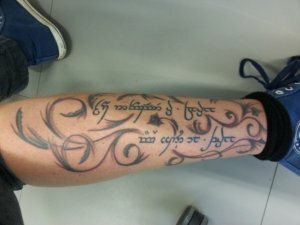 It's in Quenya (I got it translated into Elvish over in the quenya translation forum), and means "The freest persons have thoughts that wander far"
Some months ago (august 2012) you helped me finalize a tengwar transcription for a tattoo. I already posted the result directly after having done the tattoo. Btw: It looks like it is a little bit red, but that's the rest of the colour the artist used for the design, not some kind of infection. HI, i am about to get my name tattooed on me. Here is what I need you to transcript for me. "Sergio Vilaroel Pichelbauer" , "captain of my fate, Master of my soul" and "13"
Extra Info: all of the "Rs" are pronounced as in car (for Sergio Vilaroel Pichelbauer), and I would also like you to write it in quenya style, as in vowels above the letter they follow if it is possible. And instead of putting vowels underneath to be on a carrier. Thats IT! I really appreciate what you do! Keep up the good work! Thanks! All the way from Venezuela. Hi folks ! Sorry for not posting for a week, I had a crazy one... still going, but let's take a little TORC break. ah11 : nice to know, keep in touch with us to share the results ! Rizman : WOW, you had a very good idea ! Can you send me a higher resolution pic of that new tattoo ? I'd like to put it in my collection You can send it to me at isildilme@hotmail.com... I'd be very happy to have it. If it's not possible, I understand. svpsvp : If you insist to have it that way, I can do it. Normally, I put the vowels on the following consonnant, because it's more logical in English (as in Sindarin), and also because when we have diphthongs, it respects the same rule. But in Quenya these diphthongs are written the same way, so there should be no problem using them in a mode with the vowels are on the preceeding consonnant as in Quenya, as this is your wish. And in my mode, only the silent "e" is underneath, so in your requests there would be just the "e" of "fate" written that way... you prefer to have a normal "e" on a carrier ? Is there any possibility you could romanize this graffiti? It was found on a wall in Philadelphia. My friend sent me it because I've been able to figure out some Tengwar puzzles before, but even using a chart, I was not able to get very far. I suspect it may be in Quenya (or is supposed to be in Quenya) but I'm really not sure. For example, the second character of the second word is totally unfamiliar to me. It might even be a transcription of a language that's neither an Elven one nor English. We don't know! It could also just be full of errors. Anyway, we're in no hurry. Thanks for keeping this thread alive for so many years! That was exciting and funny ! I once received a full letter in Tengwar to transcribe from an official Translation organisation that didn't have any expert in Tengwar. That was something ! So I was excite about your discovery. Sadly, it's indeed including some errors. It's English, but with the tehtar over the preceeding consonnant instead of the following like it is expected in this language. I read "Darnok and Jalad at Tanajra", but the "o" of the first words is my guess as it's not written properly. I found on the net this sentence from Star Trek (I'm not very knowledgeable about ST) : "Darmok and Jalad at Tanagra", so I guess that this was what this guy/lady tried to write, with some errors ! The second tengwa of the second word is the tengwar for "d" in English, with the bar over meaning that it's preceeded by the nasal of the same serie, so "nd". They communicate entirely in metaphors, it's an interesting concept. That was also one of my favorite episodes, as well! Did I see a movie ? Not sure... maybe the recent one... mmm... I don't even remember. Hi Isildilmë. Firstly, I'd like to say thanks for your transcriptions. I'm sure many of us would be lost without your expertise! Keep up the brilliant work. Also, I'm in need of your help. Could you please transcript the following for me, if possible: Harië handë ná harië túrë (Quenya), into: TGvorn(R+B), TEca(R+B), TN(R+B), TS(R+B) I look forward to the results, and once again, thank you! I would love it if you could translate these from English in Tengwar Galvorn (R+B). Each day's a gift and not a given right. Not all tears are an evil. Isildilmë wrote: I read "Darnok and Jalad at Tanajra", but the "o" of the first words is my guess as it's not written properly.